You may be wondering how many different kilt outfits are there? Well there are several depending on which particular occasion you choose to wear your kilt. Given that most people (including myself) own one kilt, you are about to see why the kilt is arguably the most versatile garment you can hang in your wardrobe. Perhaps the outfit most often seen is the kilt worn as formal wear, to occasions such as weddings, formal dinners, visiting the theatre, or indeed anywhere that you want to look and feel like a million dollars. 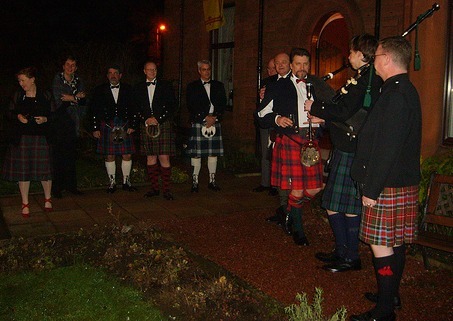 A very good example can be seen in the photo below, it shows a group of Ladies and Gentlemen being welcomed by their host, and a piper, to a Burns Supper. Note that on this photo, you can see both formal and semi-formal outfits. The formal outfit is often referred to as Full Highland Dress, so what do you need to complete it? Well one of the major differences in the various kilt outfits, is what's worn above the kilt, and for formal wear the Prince Charlie Jacket is almost always chosen. This is the most elegant of all the kilt jackets (it is equivalent to a dinner jacket), and is teamed with a white dress shirt, often winged collar, and bow tie. You would also wear a dress sporran and Ghillie Brogues, these dress kilt shoes are specifically designed to be worn with the kilt. For semi-formal wear you would choose a different jacket, the one that fits this outfit best is the Argyle kilt jacket in black berathea, wool, which comes with a matching waistcoat (vest). It would be teamed with a white shirt and tie, if the occasion called for it, a bow tie, see the photo above for an example of this outfit. A semi-dress sporran is worn with this outfit, which is less flamboyant than a dress sporran, but more so than the day version. Ghillie Brouges can also be worn with this outfit, and the kilt hose tend to be dark colours, often contrasting with the tartan of your kilt. The outfit worn for day wear, although extremely stylish is naturally less flamboyant than that for formal or semi-formal wear. Once again by changing just a few of the accessories you give your kilt a totally different look. The jacket favoured for day wear is usually an Argyle, worn with a normal shirt and tie (often a tartan tie is chosen). The sporran would also be a day sporran, which dresses down your kilt due to the fact that it is leather, and once again not as flamboyant as the dress or semi-dress version. Shoes for day wear would be a normal pair of brogues, either black or brown depending on your preference. People also like to wear darker coloured kilt hose for day wear, but do bear in mind there are no rules, so wear what you are comfortable with. 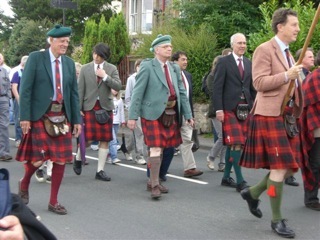 Below you can see a photo of the clan McNab on a clan march, and it shows how versatile day wear can be. The kilt is an excellent garment to wear in a casual setting, and to attain the casual look you once again simply change the accessories. 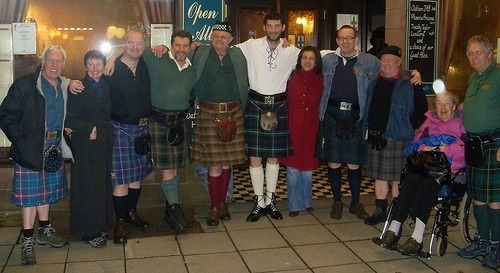 If you look at the following photo you can see what I mean, this group are enjoying a night out, and you can see an array of different tartans being displayed. Jacobite shirt, which is both casual yet stylish. And many people like to take it one step further and add a chieftian waistcoat, these two items together give these kilt outfits a somewhat period look. And to go with this hiking boots are often worn, which are both comfortable and stylish. At football and rugby matches you can often see the kilt being worn with a simple T-shirt or rugby shirt, and this I would say is the ultimate casual look for your kilt. So as you can see the kilt is indeed a truly versatile garment, which can be dressed either up or down. But one thing is for certain, when you are dressed in one of your kilt outfits whatever the occasion, you will be noticed, so have great fun wearing it.